Layout isn't just important with tile work, the direction laminate is installed can have a big impact on size perception of the room. Installing laminate on a 45 to the room requires more cuts and a little more material, but can be wellworth the extra cost. This laminate was installed longways to give the room a larger feel. Chair rail added in a room with high ceilings is a great way to divide the room into multiple colors. Glued down hand scraped gunstock oak. Cork is a unique and relatively inexpensive floor covering. Most cork is of laminate/floating construction and is made to be installed with a vapor barrier over most types of substrates. The cork in this picture is 1/8" glue down cork. It is very inexpensive and easy to install. Like most resilient flooring lots of work needs to be put into smoothing the floor to prevent imperfections from transferring. Cork as great thermal and sound isolation properties. This laminate is made to resemble a sanded and finished wood floor. Not only is it cheaper but it is very durable and easy to clean. If new baseboard is not yet in place when the laminate is installed, it is beneficial to run the vapor barrier up the wall about 2 inches. It is then overlapped by the baseboard and insures no moisture can be transfers to the laminate from the substrate. Around the perimeters of the installation an adequate gap must be obtained to allow for expansion. Silicone can be used in areas where moisture may have a chance of penetrating the gap. This picture of a job in progress was an entire house (1600sqft) of strain woven bamboo. These 5ft planks where installed in all bedrooms, around island in kitchen and common areas with no transitions. 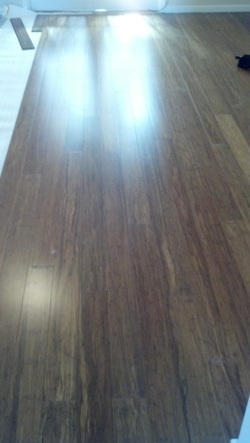 Laminate floor is very affordable and and if installed properly can last decades. It is a great product for use in mobile homes such as this one but in often cases floor leveling has to be done to ensure a proper installation. Many double wides have a variance in subfloor height in the middle. Typically, 1or 2 bags of self leveling concrete is all thats needed to fix the problem.